Are you facing a property damage emergency in the Fort Worth area? Did you know that you could get same-day services within 45 minutes of an emergency call? In fact, you can contact 911 Restoration of Fort Worth to get help 24/7/365. Our property restoration techs will arrive at your property ready to go to work. All techs are licensed, bonded, and insured to handle all aspects of property restoration. We can help you recover from damage caused by floods, fires, mold growth, sewage backup, and more. You deserve help from the best after experiencing property damage. You can get the help you need immediately by contacting 911 Restoration of Fort Worth for a free visual inspection for property owners only. Let us focus on returning your property to better-than-new condition. You deserve a Fresh Start after experiencing property damage. 911 Restoration of Fort Worth can make sure that you get one. 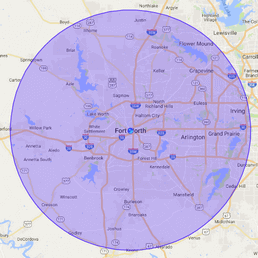 Water damage can have many different sources in Fort Worth, Irving, and Arlington. Some property owners discover water damage after a flood, a hurricane, or another storm. Plumbing disasters, such as leaking pipes or frozen pipes, can also allow excess water into your home or business. 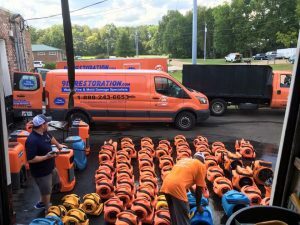 911 Restoration of Fort Worth can use industrial-grade pumps, air blowers, and dehumidifiers to completely extract water from your home or business. We understand the importance of removing water quickly to prevent additional damage from occurring. Techs can use infrared scanners to check for moisture once most of the water is extracted. Taking care of total dehumidification can reduce the risks that you will experience mold growth after a pipe bursts or your property floods. Make sure you are ready to handle water damage restoration the right way by calling the professionals at 911 Restoration of Fort Worth today. Property owners in Fort Worth and Arlington may discover mold growth in a number of ways. Sometimes, a strange, musty smell reveals the presence of mold, or dark marks on the wall. Generally, a small spot of visible mold means there is a larger hidden infestation. 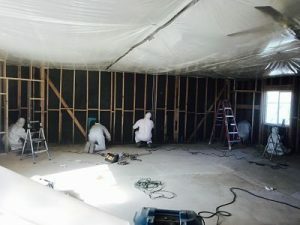 911 Restoration of Fort Worth is IICRC-certified to handle mold removal in both commercial and residential properties. Mold remediation techs know how to locate mold, prevent it from spreading, and remove it from your home or business. We utilize specialized chemicals to disinfect any areas impacted by mold growth. This step in the mold removal process can prevent mold from returning in the future. You deserve a completely restored and repaired home or business after a mold infestation. 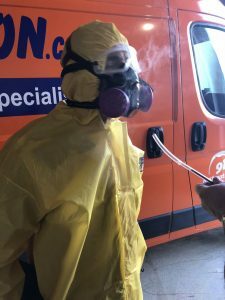 911 Restoration of Fort Worth will take care of everything during the mold removal process, including odor removal. By the time the techs are done, you should not even be able to tell that a mold infestation ever occurred. Call us now to let us get to work on mold remediation for you. Sewage can spill back into homes and businesses around Arlington, Fort Worth, and Irving due to a plumbing clog or heavy rains and flooding. Sewage spills can leave you dealing with excess water that is carrying dangerous pathogens. 911 Restoration of Fort Worth has the equipment and training to handle sewage cleanup. You don’t need to endanger your health by trying to cleanup a sewage spill on your own. Let us address any spill immediately. As a locally owned and operated sewage cleanup company, we can reach your property to handle a sewage spill the same day it occurs. Techs will remove sewage, disinfect your property, and ensure that any sewage odors are removed. Get professional help handling a sewage spill by contacting 911 Restoration of Fort Worth today. Fire is an incredibly destructive force that can rage through homes and businesses throughout Fort Worth, Irving, and Arlington. Property owners often have to deal with water damage after a fire, especially if firefighters were called to the scene. Fires also cause smoke, soot, and ash damage. This can make the fire damage restoration process complicated. Fortunately, the fire damage restoration techs at 911 Restoration of Fort Worth have the skills and experience to handle any fire. Let us bring your property back to better-than-new condition with our fire damage cleanup services. We believe in assessing your unique fire damage restoration needs. You can reach out to us to get a free fire damage assessment so you know what the fire damage restoration process will require. The techs at 911 Restoration of Fort Worth will be dedicated to making sure your property is returned to pristine condition after a fire, so you can have a Fresh Start. Disasters can strike any one of us at any time. Property disasters are often caused by hurricanes, tornados, fires, or plumbing issues. A disaster comes with no warning and can leave you unsure about where to turn for help. 911 Restoration of Fort Worth can help you recover from any property disaster. The techs at 911 Restoration of Fort Worth are trained and ready to handle flood damage, fire damage, and any other issue you are facing. You can also rely on us to check your property for structural damage after a disaster. Let us develop a complete restoration plan for your home or business. You deserve to have your property returned to better-than-new condition after a disaster. Working with the experienced techs at 911 Restoration of Fort Worth can make the disaster restoration process stress-free. Call now to find out how you can get a Fresh Start in your home or business.